(February 24, 2014- Boston, MA): Democratic Candidate for Lt. 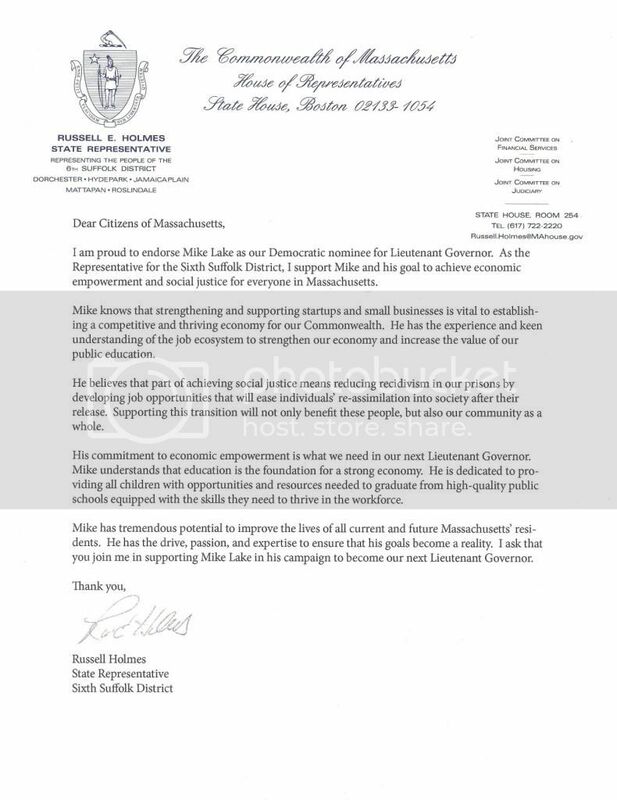 Governor Mike Lake was officially endorsed by State Representative Russell Holmes of the Sixth Suffolk District this week. Holmes emphasized his shared commitment to strengthening business communities and improving public education for children as a means of creating economic empowerment. Representative Holmes--whose district includes portions of Dorchester, Mattapan, Hyde Park, Roslindale, and Jamaica Plain—said he commends Lake’s plans for providing world-class educational opportunities for all Massachusetts’ children. "I am proud to have the endorsement of Representative Holmes, a champion of community building," Lake said. "I look forward to working with him to develop the education system our children deserve, to strengthen the economy and create jobs that bring hope and opportunity to our communities."